Primark reject the opportunity to create a Facebook fan page because unofficial Primark Appreciation Society Facebook Group is so successful! I have previously written about retailers on Facebook with a post entitled '5 Great Examples of retailers using Facebook' One of the best examples I could find was the PRIMARK APPRECIATION SOCIETY and this has gained more prominence in recent months. The Primark Appreciation Society Facebook group now has 98,375 members! More remarkable is the fact that this group was not created by Primark, but by a student from Oxford Brookes University called Sophie Bellchambers. According to Marketing magazine (14 Nov 2007) the group now features 335 photos uploaded by users and more than 340 discussion threads with topics such as products, staff and paper bags. The latest issue of Marketing (21 Nov 2007) includes a review of Primark.co.uk, authored by Sophie Bellchambers, the founder of the Primark Appreciation Society on Facebook. 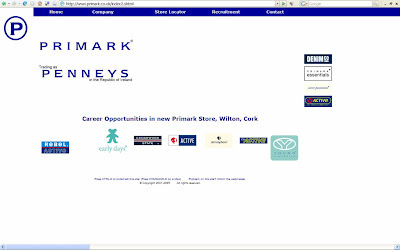 (link) She argues that Primark's website is not up to scratch and that this has been a major contributory factor to the growth of the Primark Appreciation Society. Furthermore she argues that the volume of people on her Facebook group indicates a genuine desire for an 'online shop, or at least a forum showing what's new in store.' She also takes the opportunity to plug the idea of an Express queue for Christmas! Primark are not designing a fan page / advertiser page on Facebook though - there will be no opportunity for Facebook users to publicly declare 'I am a fan of Primark.' The justification is that the Primark Appreciation Society is already well-supported and according to a Primark spokesman 'an independent Facebook group launched by our customers is of far more value than anything we could do.' (Marketing 14 Nov 2007). A Facebook page offers more to an advertiser than a Facebook Group though. A Facebook Ad page is publicly searchable through a Search Engine and provides a useful (SEO friendly) linkback to the main website. It is also possible to track popularity by using the Insight tools and advertisers can promote it through targeted ads to a users Feeds. Many Facebook users are slightly suspicious of the new ad mechanisms on the site, but Primark seem to be in a position where they can test these new models, however it doesn't look like they are going to at the moment. Nick Burcher writes: "The popularity of the Primark Appreciation Society on Facebook shows how keen Primark customers are to interact with the brand. Many advertisers are unsure of the response they would get if they created a fan page, but Primark are in an unique position where their customers are crying out for more online / Facebook interaction with them. Consumers are actively seeking out Primark online and creating a Facebook fan page, coupled with a redesign of Primark.co.uk, would create a great opportunity to show off product , give sneak previews and offer discount vouchers to their loyal customers. The new Facebook ad platform is based on word of mouth / trusted referrals and with 98,375 members in an unofficial group, Primark could get some great results from this new advertising model."